The unrestored portions of the organ are owned by us, The Alexandra Palace Organ Appeal. They are safely stored and insured at the factory of Henry Willis & Sons, the Organbuilder. Once restored and installed in The Palace, portions become owned by The Alexandra Palace. Henry Willis & Sons owns none of the instrument. Are Appeal Funds being used for Tuning and Maintenance? No. The Alexandra Palace pays for tuning and maintenance, a substantial sum per year. As its constitution states, the Appeal exists to raise money to complete the restoration, not to pay for day-day maintenance of the instrument already there. Why has The Appeal achieved only limited success so far? The Alexandra Palace Organ was totally destroyed in 1873. 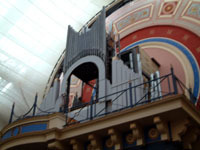 The Rebuilt Alexandra Palace Organ was extensively vandalized in 1918 by British soldiers. The 1929 instrument was almost destroyed by Hitler and neglect in 1948 and beyond. In total, the Organ was heard publically for around 15 years in the first half of the 20th century. The final destruction of the case and 32' front in the 1980 fire would probably have ended the story, but yet again, as at all times in its terrible history, there are people passionate enough to believe that this instrument is simply too important to be lost. So instead, it was partly restored in 1990 and has been heard regularly since then, a total of 15 years. This, in itself, is an enormous success. Secondly, whilst half the instrument is playing on the gallery, it is impossible to ignore, in many senses! Instead of languishing in a storeroom somewhere, its future uncertain, or even - as many have sought - melted down for scrap metal, the playing instrument is a constant reminder that the complete Alexandra Palace Organ will one day be restored in The Great Hall of the Alexandra Palace. Due to The Appeal's actions since 1983 it has been saved from destruction, and it is only due to these actions that there is any room for discussion about the best way of achieving the restoration. So, this also is an enormous success. The remaining portions of the organ await restoration. Plans have been made and we need only the funding to achieve total success. I have heard that the organ will cost £1.5m to restore. Is this true? The current quotation we have from the Organbuilder is for £968,000 as from its current state. So what about the claims that Henry Willis & Sons have 'stolen' two ranks of pipes from the Choir Organ? These claims are misleading. The two ranks in question are demonstrably not original Alexandra Palace pipework, and in fact belonged to the Henry Willis III organ from the Seventh Church of Christ Scientist, London. When this Organ was eventually rebuilt at Emmanuel Church, Wylde Green, Sutton Coldfield, they were returned to their rightful home. They were simply loaned to The Palace by the Organbuilder to fill two empty sets of holes on a soundboard, a fact which from their inadequate scaling for the Alexandra Palace would have been evident to anyone with modest knowledge of Organbuilding. The original 1875 and 1929 Alexandra Palace pipework can be seen sitting in pipe bins at the Liverpool factory of Henry Willis & Sons awaiting restoration. I have heard that part of the building frame is unstable and about to collapse. Is this true? It is a well-worn hobbyhorse of the detractors of The Appeal and the organbuilder that part of the instrument is structurally unsafe. Upon hearing of such allegations The Appeal carried out its duty in assuring that donors' money was being properly spent and, in conjunction with The Palace, commissioned a professional structural engineer to report on the stability of the instrument. The content of the engineer's report was that the instrument was quite safe exactly as it was and in no danger of collapse but that he recommended the addition of some cross-bracing members to further restrict lateral (i.e. side-side) movement of the unenclosed Solo section. This work was immediately carried out by the organbuilder. Why is the Solo soundboard giving trouble some 15 years after its installation? Since roughly 2002, a succession of hot summers coupled with the clear glass roof of the Great Hall have meant that the Solo organ, in its exalted position just behind the uppermost case pipes, and unprotected by the case, has been baked by the sun and subject to extreme humidity changes in a very short space of time. Apart from creating great tuning difficulties, this has resulted in two of the four stops becoming nonfunctional due to stuck sliders. 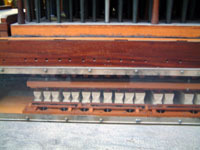 The conditions that this soundboard has had to endure are extremely unusual for an Organ and it is a testament to the good work of the organbuilder that it functioned reliably for so long. The Appeal has long been aware of the negative impression these very loud stops create when they are out of tune, and thus decided to sponsor a relocation of the soundboard until such time as the protective enclosing organ case is built. 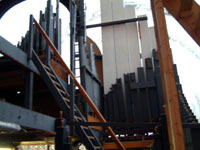 The soundboard was removed in September 2005. When opened up, it was found that the damage was more severe than expected and a result of water entering the hall through the roof as well as climatic conditions. It is even more remarkable, then, that the soundboard continued to function well as long as it did, with two of the four heavy-pressure stops available until its removal. The additional funds required to repair this further damage will be the subject of an insurance claim by The Palace. The problems with the roof have been fixed. I have heard claims that all the existing work will eventually 'have to be done again'. Are these true? It is easy to consider such claims out of context. The context of our restoration is piecemeal, and the aim is to keep the organ playing whilst restoration proceeds. To this end, Henry Willis 4 devised a rather clever phased restoration scheme, whose primary goal was to complete some of each of the divisions to give a balanced effect and to generate further interest in the project for the first phase of restoration (1990). Some of his thoughts on the matter can be read here. This of necessity meant that some of the more minor work (particularly in the building frame) was temporary, since the organ would have been far less useful as a musical instrument if the final frame had been installed, leading to divisions spatially too distant. Conversely, some of the more major work was final, such as the pipework or soundboards that were restored or made new. Also to factor into the equation is the special situation of the Great Hall as a very multi-purpose venue, where the main vehicular access door is close to the Organ Gallery, and the Organ is occasionally exposed to staggering amounts of debris. This is not intended to be a criticism of the Alexandra Palace, the Hall by its nature is multipurpose and the lack of a case for the Organ exacerbates the situation. This has meant that over the last 15 years, enough dust and debris have accumulated to represent 50 years in an Organ this size. It is testament to the good work of the Organbuilder that the instrument remains playable. So yes, the instrument will have to 'come down' and be put up again in the near future, but in the context of a clean, overhaul and replacement of some temporary work with final work, ready for the next stage of restoration. This most certainly is not 'doing the work again' and in some of these claims Ian Bell has been quoted out of context yet again. If there is a question you would like to see answered on this page, please click here to Email: webmaster@allypallyorgan.org.uk.